The Bat Detective World Tour starts today! Over the next few months we’ll be regularly uploading new sets of data to Bat Detective from different countries across the globe – from Europe to Africa, the Americas and Asia – each with its own selection of bat species alongside other acoustic inhabitants. Today we begin our global bat search in the United Kingdom, home of the Bat Detective team and the Bat Conservation Trust (BCT). We’ve just uploaded a brand new set of audio recordings from the UK for our citizen scientists to explore, so to get involved, head across to the Bat Detective site right now. These recordings are from surveys carried out across Great Britain between 2005 and 2010 – you can see their locations on the map below. The sounds you can expect to hear in these recordings are similar to the earlier Bat Detective data from Eastern Europe, including many of the same bat species, such as pipistrelles, serotines and noctule bats. Found across much of continental Europe, these are also among the UK’s most widespread bats, some of which you’ll probably have seen or heard through a detector if you’ve ever been out for a British bat walk or survey. They’re also among the main species surveyed in the UK as part of the BCT’s National Bat Monitoring Programme (NBMP), a huge ongoing citizen science project that has been running for over 17 years. Carried out by thousands of volunteers who are trained to recognise different species calls using acoustic bat detectors, it’s a great example of how citizen science can make a real difference to our understanding of the status of wildlife populations. 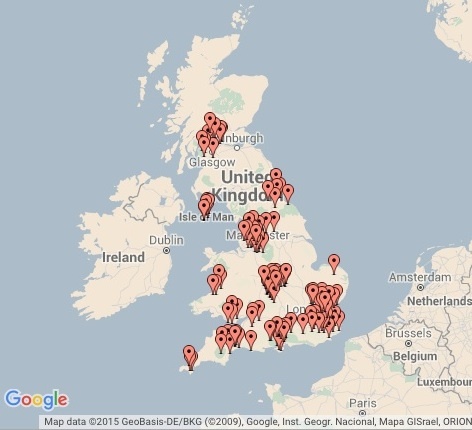 Survey locations from iBats UK project, which provided audio data for the UK segment of the Bat Detective World Tour. You can read the most recent results report from the NBMP here. A paper by the NBMP team published in the scientific journal Biological Conservation in early 2015 showed that the long-term data collected by their volunteers could detect changes in bat populations equivalent to a Red Alert (a decline of 50% in 25 years). They also suggested that the current outlook for UK bat populations seems to be relatively positive, with most bat species showing either stable or slightly increasing population trends between 1997 and 2012 – promising initial news after the declines suffered by many species during the 20th century. These results should continue to assist in future monitoring of UK bat populations, and are evidence that citizen monitoring programmes can and do provide scientifically useful data for informing conservation. To find out more about the NBMP and how you can get involved, click here to head to their website. Our goal with Bat Detective and iBats is to use similar citizen science-led approaches to develop new tools for monitoring bats on a global scale, while taking advantage of new advances in technology. As we’ve explained in previous blog posts, the data collected by iBats volunteers and labelled by Bat Detective users is helping us to develop automated software for reliably detecting and species-identifying surveyed bats. This will allow the analysis of massive amounts of survey data to be standardised across all volunteers and countries, thus increasing the usefulness of the data for drawing scientific conclusions. To read more about why collecting this data is important, read our earlier blog posts, here and here. As well as some of our better-known bat species, while you’re exploring the UK Bat Detective data, you might also encounter a rather more uncommon visitor – the migratory Nathusius’ pipistrelle (Pipistrellus nathusii), which was named BatLife Europe’s bat of the year in 2014. Much is still unknown about the presence of this tiny traveller in the UK, since it’s rarely encountered here, although some individuals are known to be resident all year round. But researchers are finding increasing evidence to suggest that this species frequently crosses the North Sea between the UK and mainland Europe. In 2013 one individual that had originally been identity ringed near Bristol was found in the Netherlands, a direct distance of nearly 600 kilometres – a colossal trip for an animal that’s only about the size of a human thumb! 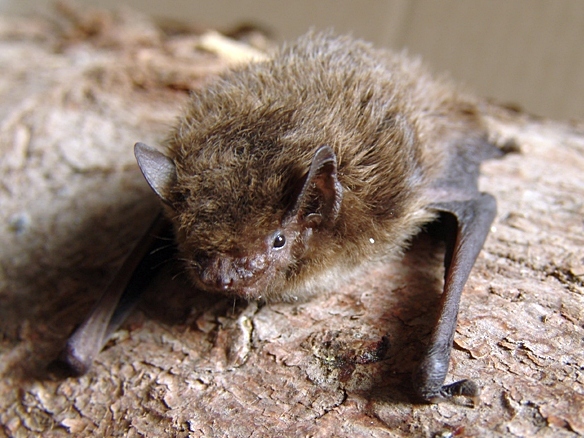 BCT are currently running a Nathusius’ pipistrelle project in the UK. Learning more about this amazing species will be important for reducing the potential human hazards it might encounter on its migrations, for example by placing wind turbines away from its main travel routes. So while searching the UK Bat Detective data you might be lucky and hear one too – for information on how to identify Nathusius’ pipistrelle from their calls, visit the BCT site. Good luck and happy searching during this first leg of the Bat Detective World Tour! If you’re unsure about whether the sounds you’re hearing are bats or not – or just want to highlight something interesting you’ve found – visit the Talk section of the website to discuss your findings with the Bat Detective community. Nathusius’ pipistrelle (photo via Wikipedia).